For those who thought that the Arab Spring revolts of last year would lead to greater freedom and democracy in the Middle East, this week's ratification of an Islamic constitution in Egypt seems like a profound disappointment. Rather than moving forward into a more modern, progressive system, the country has decided to slide deeper into a traditional mindset. The Uranus-Pluto square is strongly active in the chart of Egyptian independence from Britain, which occurred in 1922. That chart has Saturn at 5 degrees Libra and Pluto at 7 degrees Cancer. The ongoing Uranus-Pluto square currently has Uranus at 4 degrees of Aries, opposite "natal" Saturn, and Pluto opposes its own natal position (Pluto is currently at 9 degrees of Capricorn). The Arab Spring revolt happened at the Saturn return of the 1953 Egyptian Republic. Saturn represents the structure of a country, as well as aspects of its government. Pluto represents deep transformation and the roots of the country, as well as its power and its shadow side (or one aspect of its shadow). That Egyptian independence took place with Pluto in Cancer suggests a deep attachment to tradition, and potentially a tribal perspective. Transiting Pluto is bringing all of that up into awareness, and today's full moon at 7 degrees of Cancer serves as a proximal symbol for the intensity of attachment to both national pride and suspicion of change (the United States is another country with strong Cancerian placements, and it has a tradition of isolationism and is very traditional - at least by Western standards). Whether Egypt will become another stronghold of the dark side of Islam - with the kind of strong misogyny, homophobia, and general intolerance seen in places like the Taliban's Afghanistan - remains to be seen. 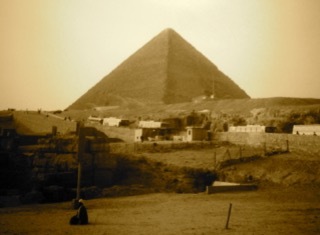 The intellectual history of Egypt suggests that a better outcome is possible, although some very trying times are ahead. Yet the Uranus-Pluto square continues to work on the horoscope of Egypt through 2015, suggesting that we haven't seen the end of the story.